Turbochargers are essential to the efficient operation of a two stroke marine diesel engine. They supply the scavenge spaces with cooled air under pressure, enabling complete combustion of diesel or heavy fuel oil in the engine. This is an article in marine engineering; in particular marine diesel engine turbochargers. We shall look at their operation and the function of pyrometers located in the turbocharger exhaust streams, used in measuring the turbochargers' health. We begin then with an overview of the operation of a marine engine turbocharger. When I was serving my apprenticeship at Harland and Wolff Belfast in the sixties, I spent some time in the engine-works department. Here the engines components were produced, assembled, and the engines tested, before being stripped for transport to the fitting-out berth. The engines were large marine diesel two-strokes built under license to Burmeister and Wain engines, a Danish Shipyard, and B & W supplied the turbochargers. In a modern large two stroke diesel engine, the exhaust gases from the cylinders or exhaust valves in the heads are directed to an exhaust gas manifold. From here they are fed into the turbine drive end of the turbocharger, driving a compressor through a direct drive shaft. The compressor draws air through a filter from the engineroom, and whilst compressing it, the air is heated. For efficient combustion, the air should be as cool as possible, therefore the pressurized air is then passed through an air cooler before being directed into the scavenge manifold. From here the air is supplied to the individual cylinders, via the scavenge ports in the cylinder liner. 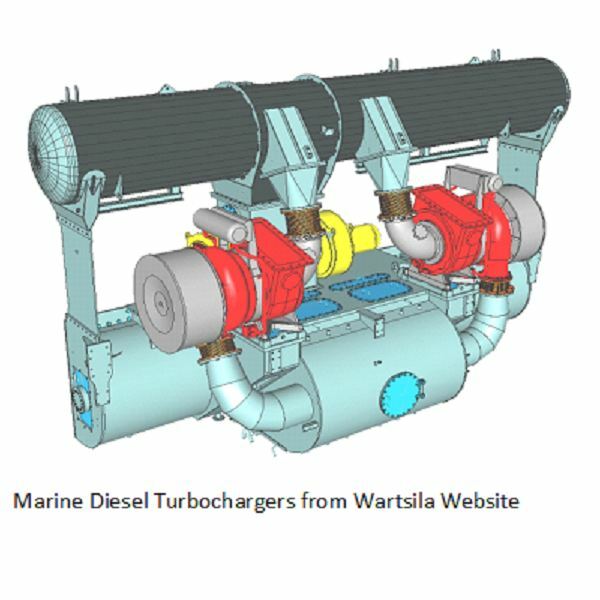 A modern turbocharger setup is shown below from Wartsila. 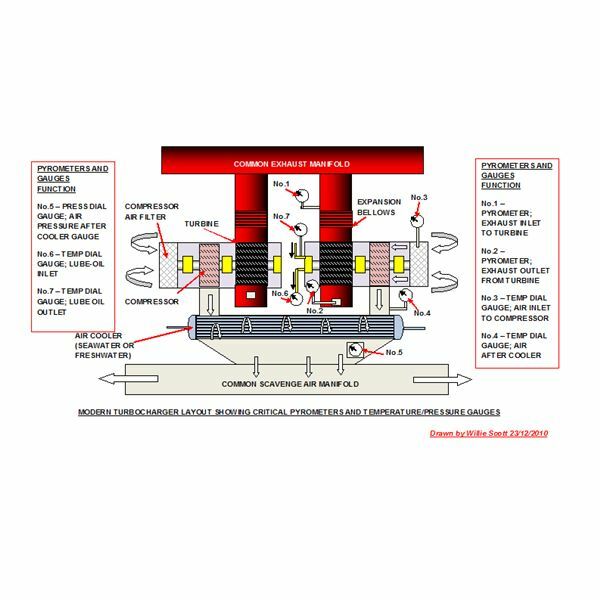 Pyrometers are not only a tool of choice for monitoring engine health, they can often provide first warning of impending operating faults in turbochargers. 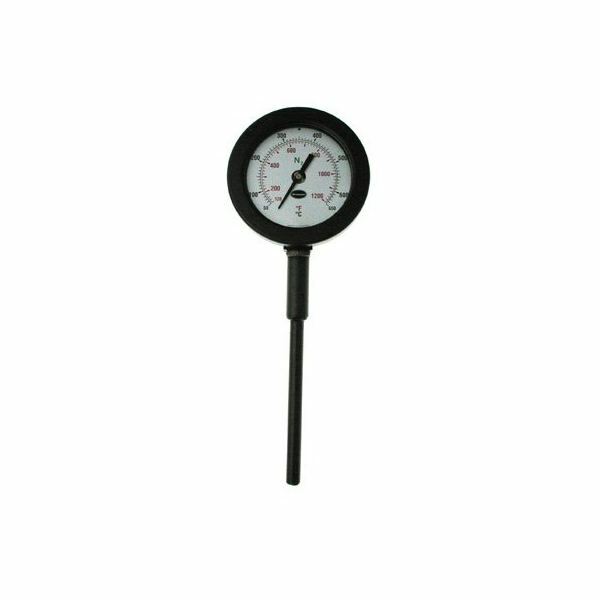 The gases from the engine exhaust system are very hot, so it is here that we locate the first pyrometer, to measure this temperature. The engine manufacturer will have stipulated the maximum temperature, and this should not be exceeded. In my time at sea as an engineer, all the Chief Engineers were very careful not to run the engines above this temperature except in an emergency. 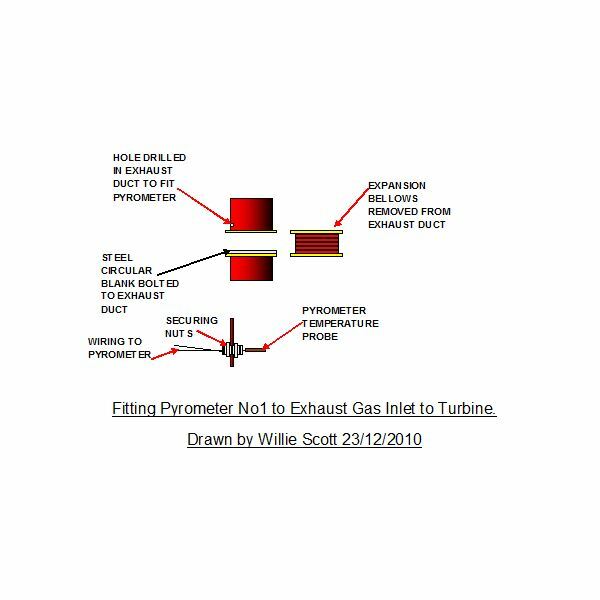 I have shown the location of the various pyrometers and temperature gauges required to check the efficient operation of the turbochargers on the above sketch. When drilling the ducting and fitting these to the unit, it is imperative that drill chippings are prevented from entering the turbine, compressor, or air cooler. Therefore I have drawn the relevant sections below with a few notes of explanation on the methods employed, some of which I used over fourty years ago on older models of turbo-blowers. 1. Remove expansion bellows from exhaust duct. 2. Bolt circular blank to bottom duct flange. 3. Drill hole in ductwork above top duct flange to suit pyrometer screwed fitting. 4. Insert pyrometer into hole and secure screwed section with nuts each side of duct. 5. 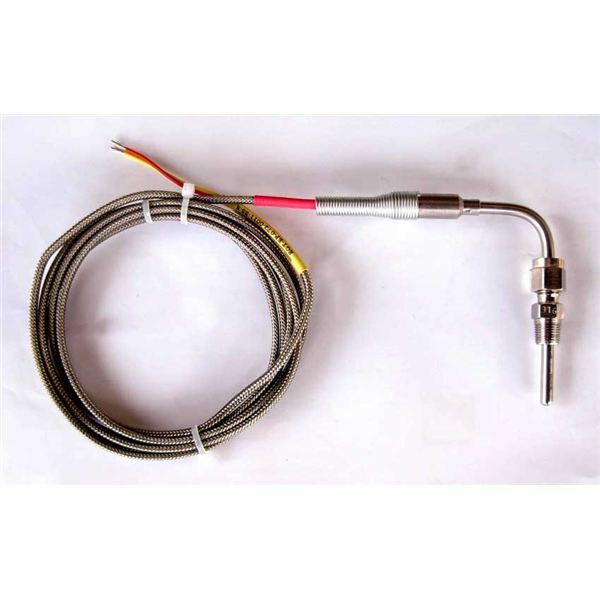 Wire-up and fit pyrometer gauge. 6. Carefully remove all drill chippings from top of blank, then remove blank. 7. Replace exhaust gas bellows, ensuring gaskets are in good condition. 1. Remove turbine examination/inspection cover. 2. Drill hole in cover to suit pyrometer screwed fitting. 3. Insert pyrometer into hole and secure screwed section with nuts each side of duct. 4. Replace inspection cover, ensuring gasket is in good condition. 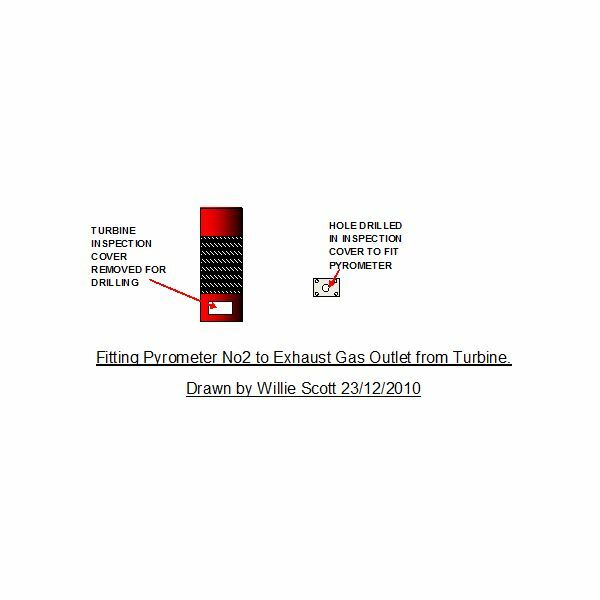 The exhaust gas pyrometer located before the turbocharger turbine will give the temperature of the gases leaving the engine, with a typical large slow speed marine diesel having an exhaust temperature of around 400°C (750°F). A rise in this temperature will indicate a number of faults in the main engine, such faulty fuel valves, sticking exhaust valves or scavenge fire; it can also indicate overloading the engine due to head-on seas or strong currents. The second pyrometer measures the exhaust temperature after the turbine has extracted its energy. Depending on the engine design parameters and conditions, the exhaust gas temperature can drop as much as 200°F. A large divergence in these temperatures can indicate the blades of the turbine sooting up, or even a few blades broken. Both of these conditions lower the efficiency of the turbine and require immediate investigation. Modern turbochargers have integral water-wash elements that clean both the turbine and compressor blades whilst the turbochargers are running. The manufacturer’s manual will give the turbochargers' turbine exhaust inlet and outlet temperatures. These will be the maximum and minimum temperatures for optimum engine performance, in terms of fuel and power efficiency. Exhaust gas pyrometers are the main instruments in determining the health of the turbochargers, but the air temperature is also an indication. The engineroom temperature inlet to the compressor, along with the outlet temperature and pressure from the air cooler will also signify whether the exhaust gas turbine is driving the compressor efficiently.